CHARLOTTE, N.C. — Hundreds of Christians flooded the Charlotte-Mecklenburg Government Center on Monday night to stand against a request from abortion advocacy groups that would ban a mobile pro-life pregnancy center from parking outside of an abortion facility. For more than a decade, both pro-life and pro-abortion residents have gathered outside of A Preferred Women’s Health Center, with numbers fluctuating from dozens to thousands. On a regular basis, pro-lifers offer literature and free assistance, as well as gift bags to mothers who decide not to go through with their appointment with death. Because of the volume of traffic at the location, the Charlotte-Mecklenburg Police Department has now requested that the Charlotte Department of Transportation study potential changes. The abortion facility and its advocates have also requested that “no parking” signs be placed in the immediate area. They claim that the mobile pregnancy center and the signs displayed by pro-lifers cause traffic visibility hazards. “This is about patient safety and safety of staff and traffic and even neighboring businesses that are having issues delivering services to people as needed due to the influx of people on Latrobe,” facility administrator Calla Hales told TWC News Charlotte. But members of the group Cities4Life note that the work of the Monroe HELP Center, which offers free help to mothers, would be hindered if the “no parking” signs are installed. They believe that abortion advocacy groups and the city are just trying to get rid of them. Lakilra Flowe, a mother who chose life because of the mobile HELP Center, stood by Kaseorg’s side, holding her infant child and nodding in agreement. Flowe now volunteers herself to help save lives outside of the abortion facility. As previously reported, Courtney Parks, a nurse with the ministry, told Christian News Network in 2015 that the RV parks along the street four times a week, and has been a blessing in the lives of many women. 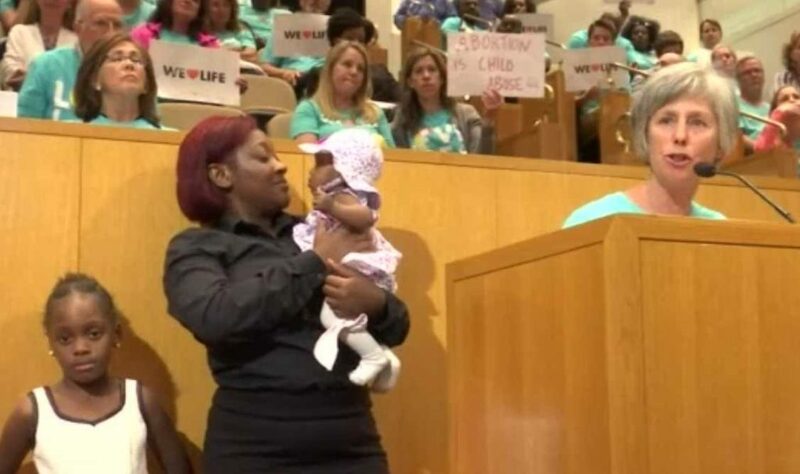 Flowe holds her baby—saved from abortion—as Kaseorg speaks. “We’ve had many instances where these ladies think that there is nothing in their womb but what the liberal media tells them—it’s just a clump of cells, just a blob of tissue, nothing there—and when I’m able to show them their eight-week little baby in their womb with a heartbeat, arms and legs moving around, …. it kind of turns a light bulb on in their head,” she explained, noting that some mothers have even seen their babies sucking their thumb. She said that hundreds have been saved from abortion each year because of those who have been ministering outside of abortion facilities in the city. A number of the women are gifted with baby showers and provided with presents to help them in welcoming their bundle of joy. 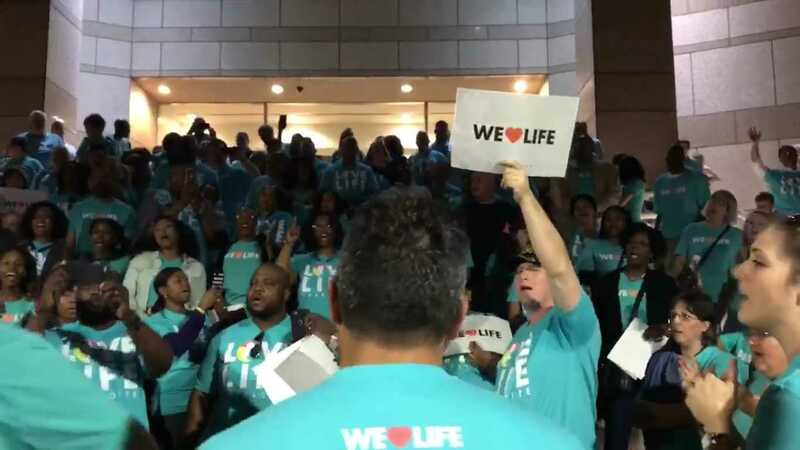 On Monday, so many Christians—all donning teal “love life Charlotte” t-shirts—packed the Charlotte-Mecklenburg Government Center that there were not enough seats in the chambers or the overflow room to hold them all. The rest gathered in the lobby exhorting one another, praying for the unborn and singing songs of praise.